A. Steel structures application in a modern building design. B. 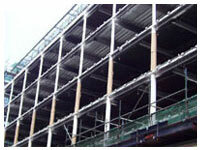 Therefore, structural steel protection is required to preserve the stability of the building in the event of fire. of withstanding the effects of fire for an appropriate period without loss of stability. To determine how these factors affect fire resistance, all Promat products and systems have been tested at NAMAS ccredited laboratories and witnessed and approved by a representative from the Fire Research Station.Tests in accordance with BS476: Part 21 has been performed on loaded beams and columns clad with fire protection material. Steel surface temperatures are monitored with thermocouples to assess the performance of the cladding, since steel fully stressed in accordance with BS 449 or BS 5950, Part 1, begins to lose its design margin of safety at temperatures around 550oC.A range of unloaded sections have also been tested to obtain data for calculating analytically, with the aid of a computer, xactly how much protection is needed for the most common steel sections and for providing fire resistance for different time periods. These and other tests have also demonstrated the ability of the cladding to remain in place, commonly termed as the ‘stickability’ of the material, for the maximum duration for which protection may be required. The degree of fire protection depends on the Hp/A section factor for the steel section. 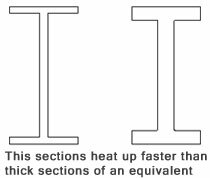 The Hp/A factor is a function of the area of the steel exposed to the fire and the mass of the steel section. The higher the Hp/A, the faster the steel section heats up, and so the greater the thickness of fire protection material required, also of relevance is the steel section itself, a thick section of steel will take longer to heat up than a thinner section, therefore it follows that where you have two steel sections of identical overall dimensions, but where the flange and web of one section is thicker material than the other, then the thicker section would generally require a lower level of protection in order to provide the same fire resistance period. 2 Life Has a very long life Has a short life. 3 Fixing Has to be fixed with technical know how. It does not take time to fix. Easy fixing but takes a lot of time. reduce the effect of adhesiveness. Specially in case of re-spraying. 1 Technical The thickness of the board is assured The thickness is not uniform. 3 Fixing Has to be fixed with technical know how. It does not take time to fix. Easy fixing but takes a lot of time. 6 Cost Cost effective, especially in long run. Very Expensive.